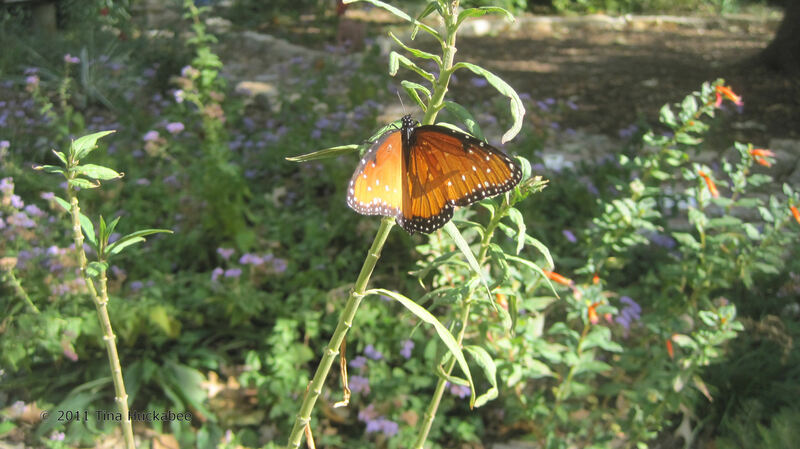 All summer, amateur and professional photographers visited Zilker Botanical Gardens, looking glum. When they walked into the Green Garden they’d invariably ask, “Do you have any butterflies? ” “No, I’m afraid not,” I would reply, shaking my head just as glumly. We would then spend some time lamenting the awful drought and heat. 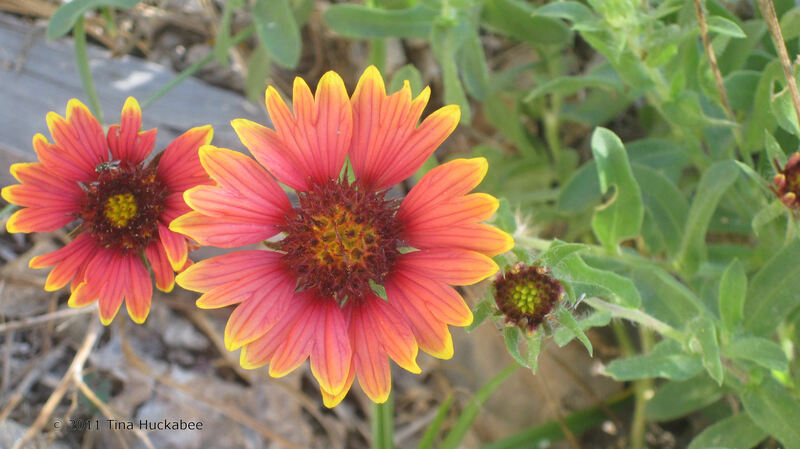 Central Texans who enjoy the great outdoors have noticed how few pollinators, especially butterflies and moths, there has been in this past year. 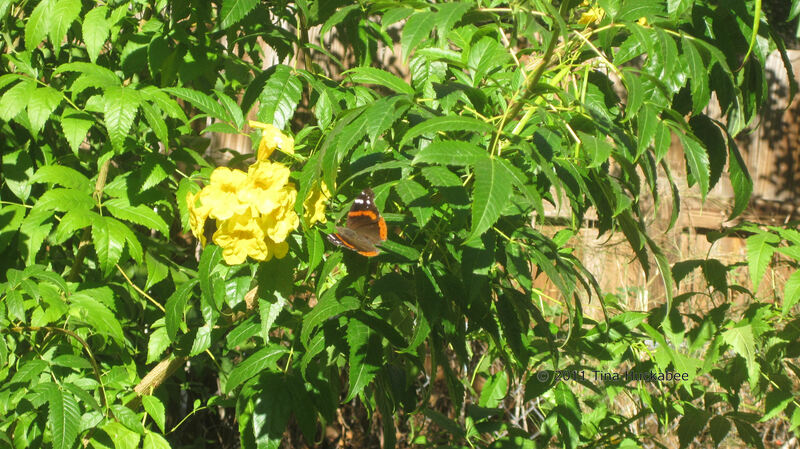 The drought is the obvious cause of the dearth of pollinators, especially in the butterfly population. Recently, I visited the Texas Gulf Coast (specifically Corpus Christi) and saw more butterflies there in two days than I’ve seen all year in Austin. 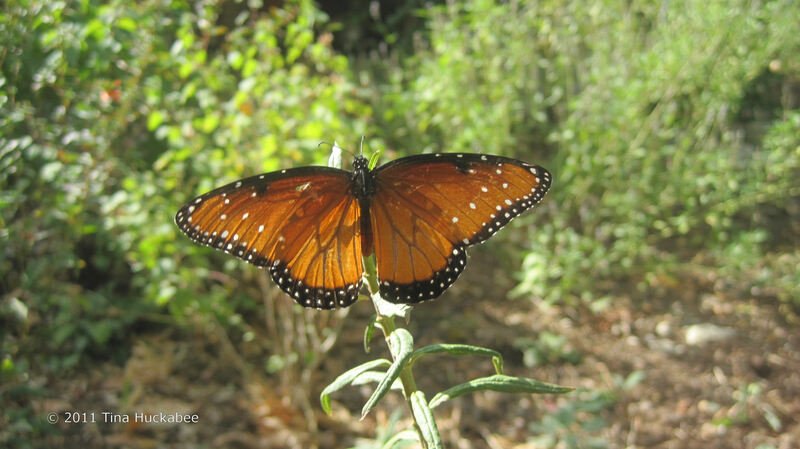 The Monarchs are still there, making a pit stop to refuel for their long trek to Mexico. They’ve been gone from my gardens for a couple of weeks and I only had a few visit this year. 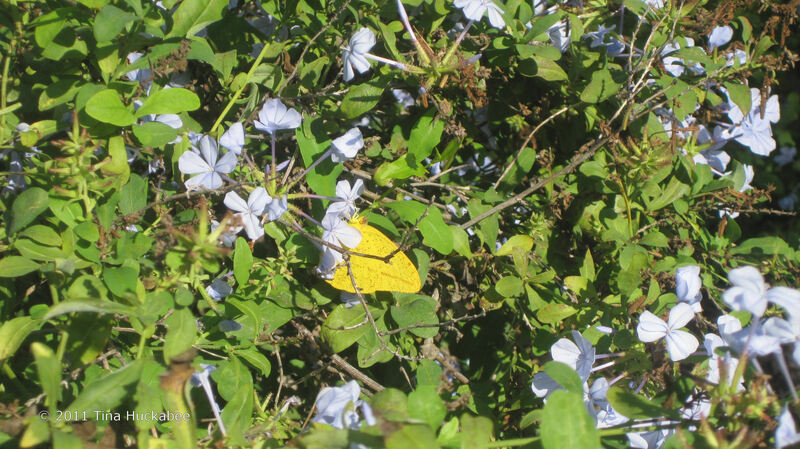 I observed numerous Sulphur Butterflies cruising blooms. I don’t have any photographic evidence, but family members bragged about the numbers of Gulf Fritillary they have. Harrumph! I haven’t seen a single Fritillary in my gardens all year. Not one. Even though the Gulf Coast region experienced drought conditions, their conditions weren’t as severe and that region didn’t have the accompanying heat that we in Central Texas suffered. It’s interesting to compare the difference that two hundred miles makes in what grows and how well. 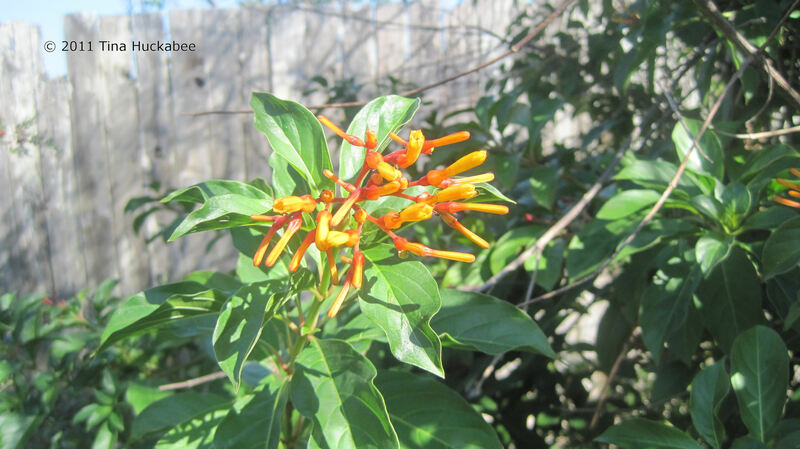 At my father’s home, this is one (of several) of his Firebush Plants (Hamelia patens). 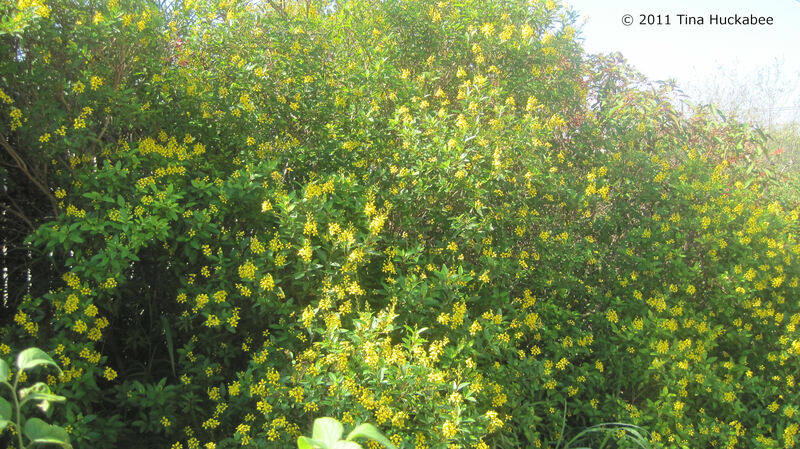 It’s about eight feet tall, six feet wide and still blooming. This is an old plant, nearly twenty years old. I remember when my mother planted it. Mine is about two feet tall and two feet wide. Not much of a comparison. To be fair, I transplanted this at the beginning of June. It transplanted beautifully, especially considering the drought and heat. I don’t think it even wilted. I coddled it for a couple of weeks, but I was impressed with how tough and resilient it is. It will never be as big or as floriferous as those in South Texas, but it’s still a good perennial to grow in Central Texas. 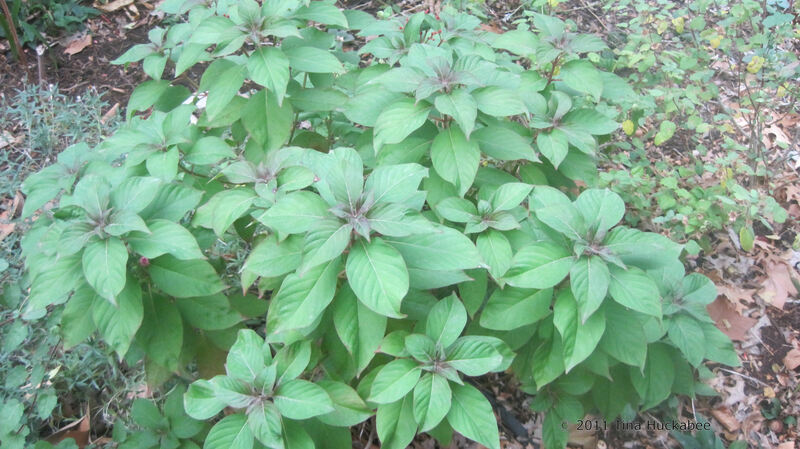 My dad also has a Golden Thyrallis (Galphimia glauca) in his garden. It’s approximately ten feet tall and at least as wide. I’ve never grown this plant, but I’ve seen it growing in Austin, although I don’t think I’ve ever seen one as large here. 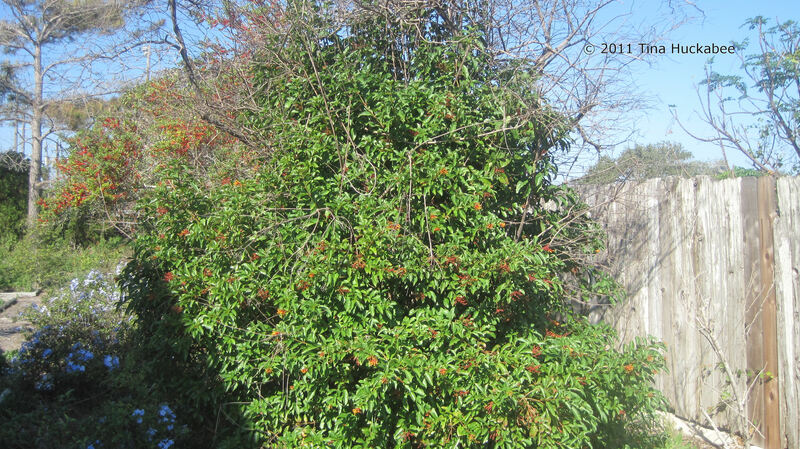 If you look closely, you can spy some red blooms of another large Firebush peeking over the Thyrallis at the top right of the photo. 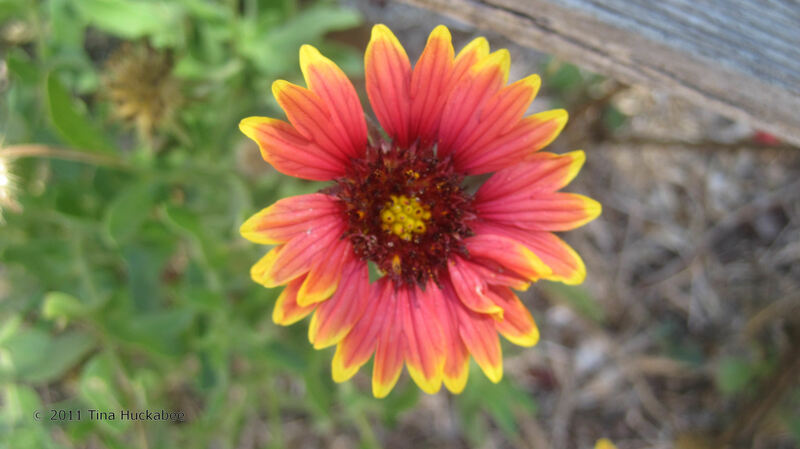 Even the Indian Blanket (Gaillardia pulchella) were still blooming in his garden. This was a surprise to me. 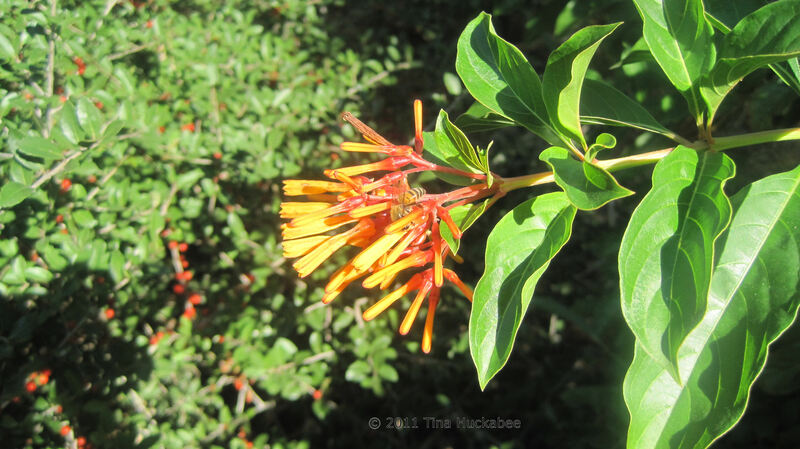 I’ve only seen this native wildflower bloom during the late spring through summer months. 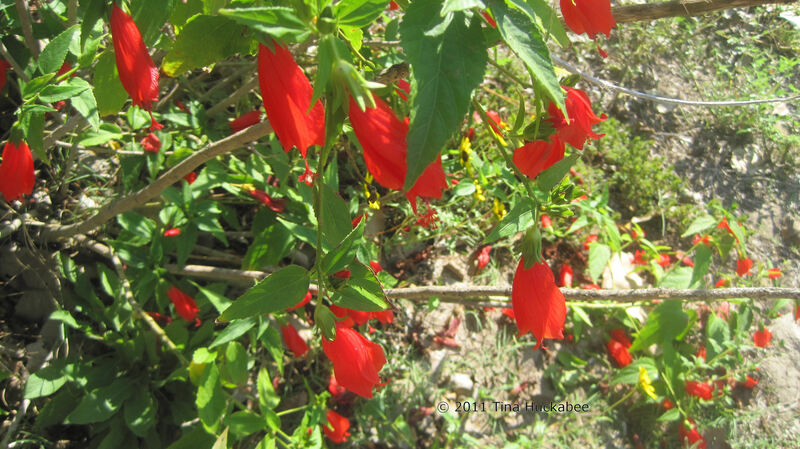 This Giant Turk’s Cap ( Malvaviscus arboreus var. penduliflorus) was magnificent. 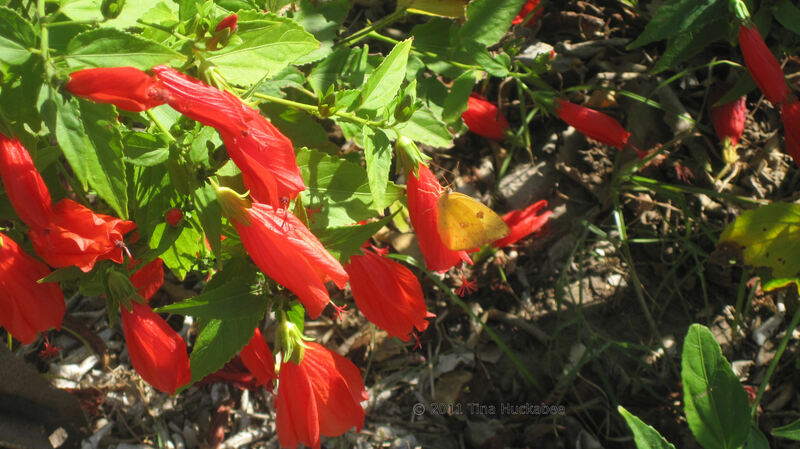 The Giant Turk’s Cap was one of the plants that I considered using when I removed Cast Iron Plant and replaced it with Pam’s Pink Turk’s Cap. I chose the Pink because I think it will be more winter hardy here in Central Texas than the Giant. 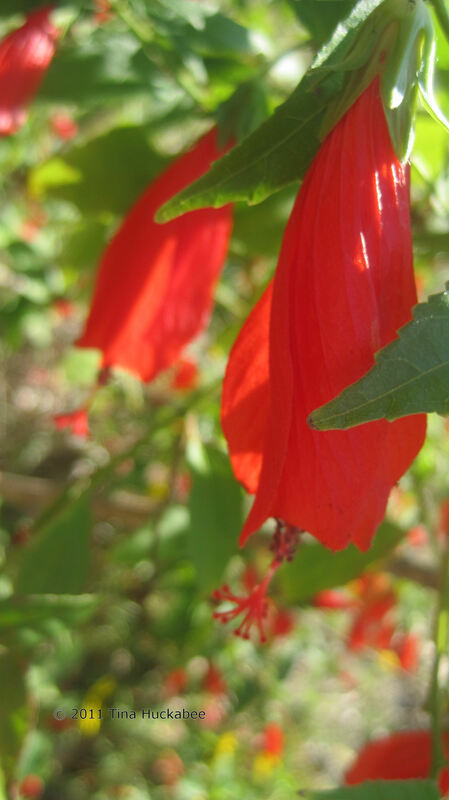 But that Giant Turk’s Cap is a beauty. 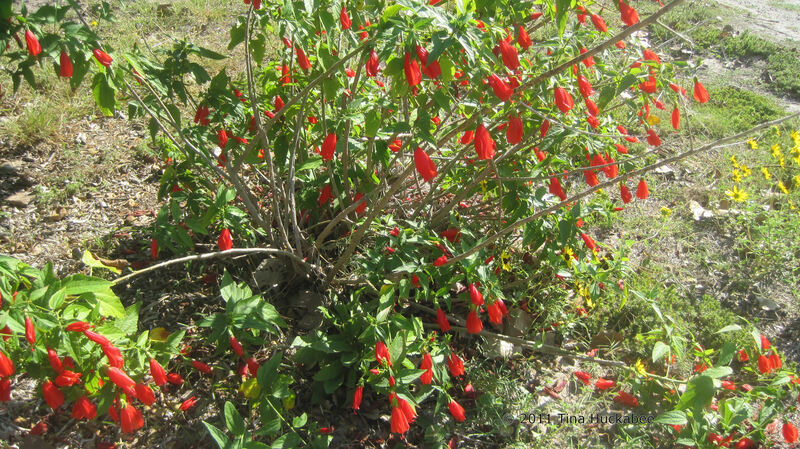 With its brilliant red, three to four-inch blooms, it’s quite a show-stopper. Central Texas has received some rain recently and it’s interesting that I’ve observed a few more butterflies flitting about. Not to our usual standards of course, but it’s heartening to see a few when they were so scarce during the Summer From Hell. I’ve observed two Red Admirals regularly visiting my Yellow Bells (Tacoma stans) in the last few weeks. 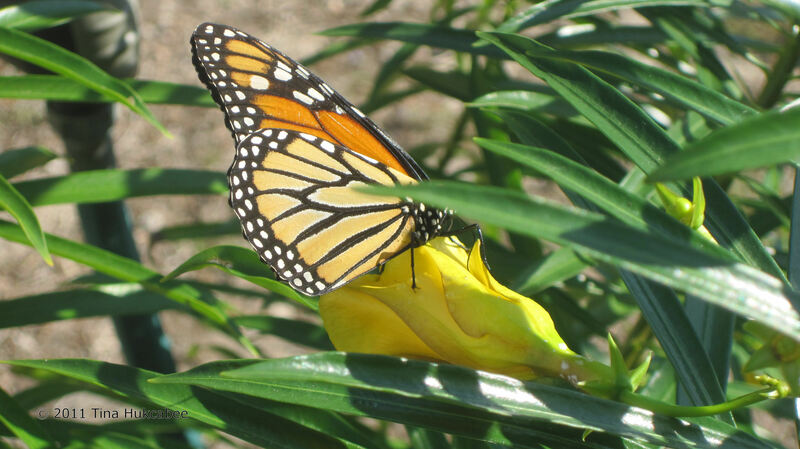 And, one Sunday afternoon, a Queen (the only Queen to visit my gardens this year), was flirting with a Butterfly Weed (Asclepias curassavica). Other than these few and the Monarchs (two or three) who migrated through earlier in the fall, there hasn’t been much of a butterfly show. Few skippers. No swallowtails. Hardly any butterflies. I’m glad there are butterflies in other areas and I hope next year Central Texas will be once again graced with their presence. 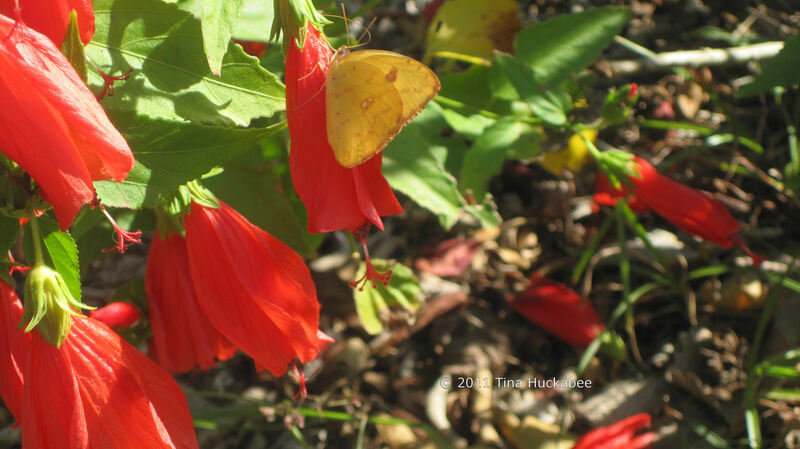 This entry was posted in Butterflies, Butterfly weed, Drought, Firebush, Giant Turk's Cap, Indian Blanket, Thyrallis, Yellow Bells by Tina. Bookmark the permalink. The garden differences in parts of Texas really are amazing. Nice to see that someone has butterflies too. The few we had this year were quite shy. Your dad’s garden looks great, love all those mature plants. some of those plants have been there for a long time. My parents were great role models for me with their love of plants, gardening and wildlife.